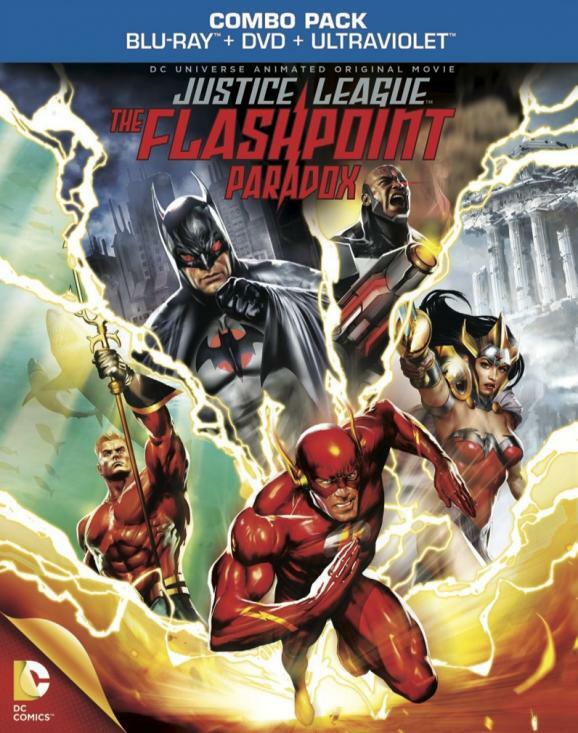 Justice League Flashpoint Paradox is the newest DC animated movie. I’ll briefly review this dvd, but there will be some spoilers ahead, so be warned. I’ll try not to spoil too much. The Flash has always been one of my absolute favorite DC comics characters (especially Barry Allen as the Flash). This filled that inner need to see his version of the speedster on screen again. We start off with Barry as a child, before he had the lab accident that created his abilities. This whole childhood flashback was a perfect prologue to our story. Following this scene, we get a battle with Flash’s rogues. The highlight isn’t Mirror Master, Captain Boomerang, or Captain Cold however. It is when Professor Zoom (The Reverse Flash) shows up. I had a bit of chills watching Flash stand his own ground, and then finally lose the battle. When the Justice League arrives to help, it got even better. Aquaman and Wonder Woman are the villains in this story. This normally wouldn’t be an issue for me, as I can see why it would work, but the lack of explanation as to why they are willing to wage war on everyone else seems to be an annoyance. There is also a secret weapon that Aquaman has (Captain Atom is chained up). It is never explained as to why, and how he will just go nuclear when the time comes. All that aside, this was a very brutal reality. Barry convinces Batman to help him recreate the lab experiment that created the Flash. After suffering third degree burns and a failed attempt, Barry goes for it again, only to have it work. This was disturbing on many levels, but really nice to see him as the unselfish hero he is. I loved it for both these aspects. So the battle continues as Wonder Woman and Aquaman go all out war on each other. Hell breaks loose, and we get a cool little cameo by an alternate Justice league and other heroes including Etrigan and The Shazam kids. Oh wait I almost forgot… Superman is in this reality, but I don’t want to spoil his presence in this world. You have to see it to believe it. Really cool. My favorite parts are at the end though. When Zoom arrives and he and Flash have their one on one battle, where the “True cause” of this reality is revealed. Seeing The Flash tap into the speed force, as well as Batman (the real Batman once everything is set right) actually shed a tear and cry, was breathtaking. So the ratings? Well, stay through the credits because we kind of get a glimpse of what might be coming next in a short clip. I’d give Justice League: Flashpoint Paradox an 8 out of 10. Not the best DC animated movie to date, but among the contenders, and definitely one of my favorites.